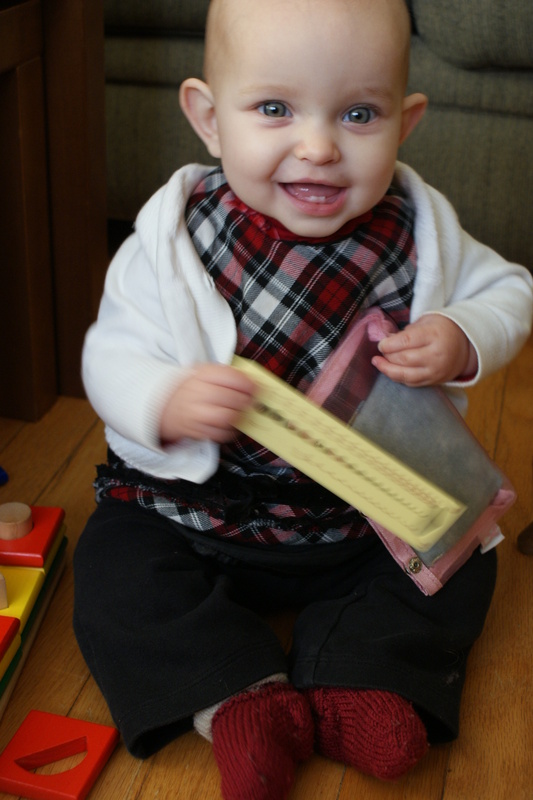 Naomi turned nine months old today – also known as the big NINO. Nine in, nine out. It just so happens that this occurred the day after the 50th anniversary of Doctor Who. So I took the only reasonable course of action I could think of. 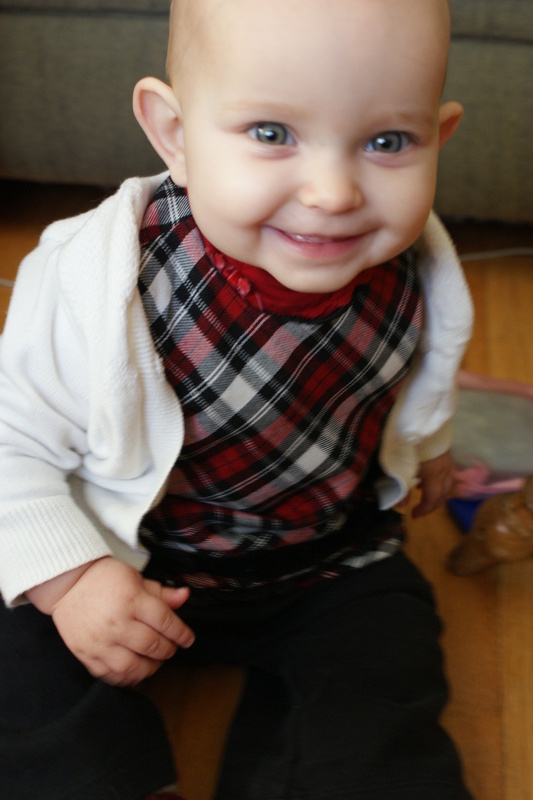 1) Dressed my baby up in the closest thing to a costume I could rustle up at a moment’s notice. Think of this as a rough interpretation of Clara Oswin Oswald. 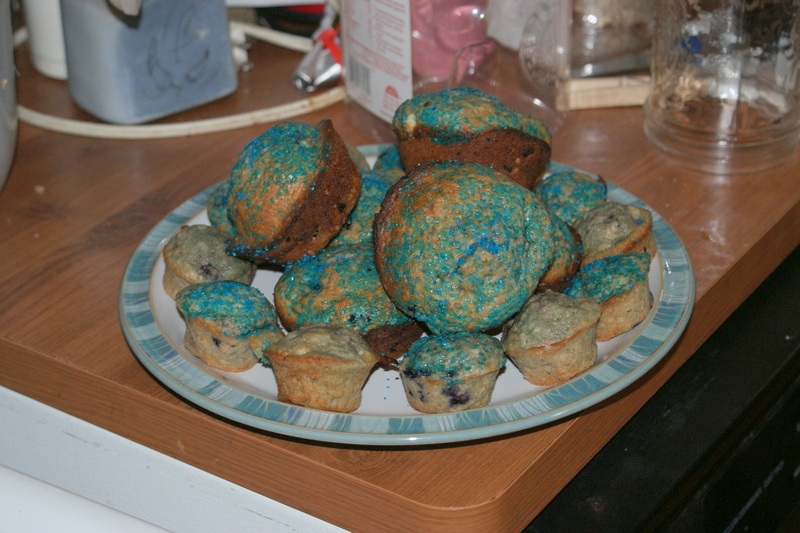 2) Whip up a batch of blueberry muffins, and wish they were bluer. 3) Invade the unsuspecting home of the nearest friend with cable to watch the 50th anniversary special. (Thanks Tina and Donna!!!) We had a blast. I won’t give any spoilers here, but if you saw it feel free to post away in the comments. Was it not awesome?! Naomi thought so. 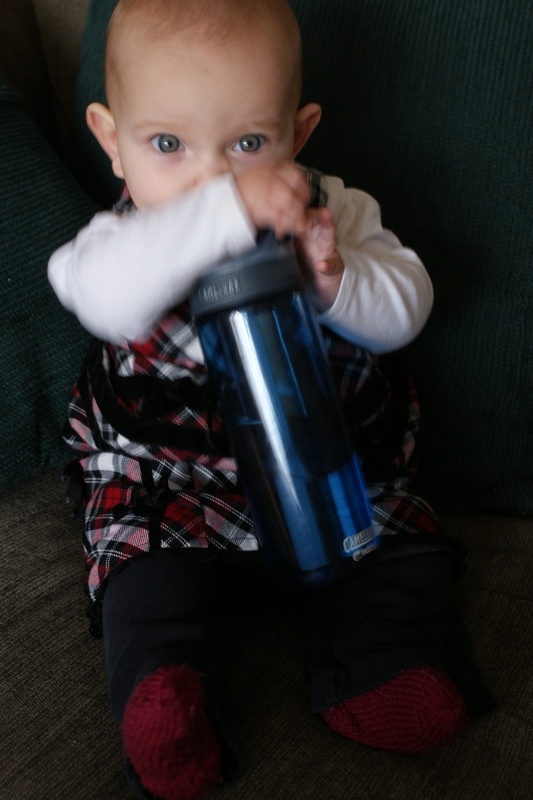 Well, at least that’s how she feels about her (read: my) more successfully TARDIS-blue camelbak. 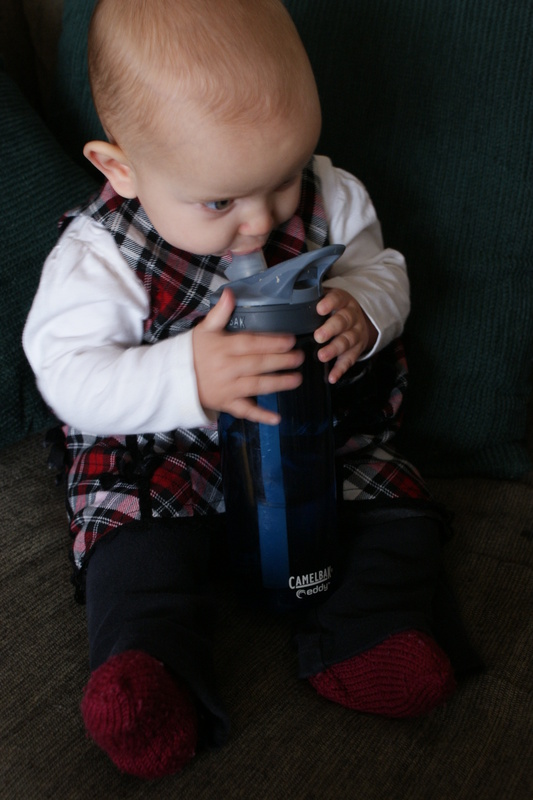 Drinking out of it has been one of her favorite morning activities for at least a month. We’ve gotten to the point that the first thing does after her morning nurse is attempt to climb over to my nightstand to steal it. Stinker. 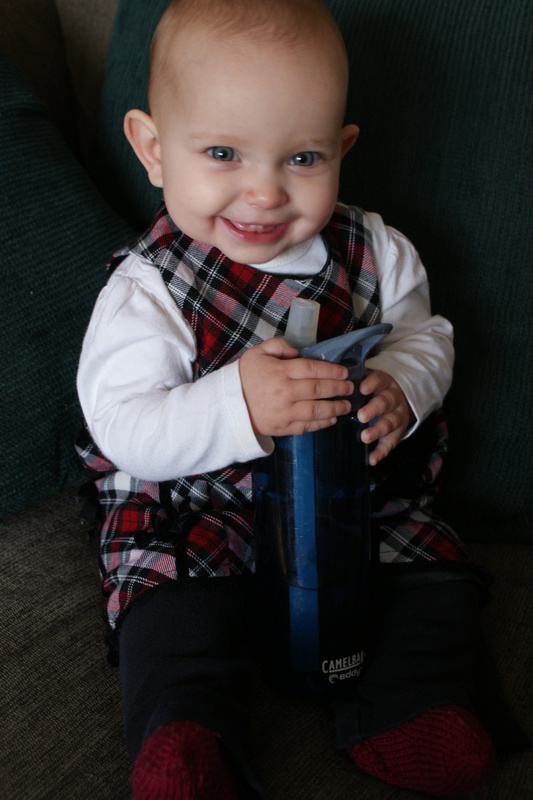 Well, what else are we up to at 9 months? 1) Talking. “Ba” is back, and she seems to be able to switch between “ba” and “da” at will. There are lots of other consonants thrown in there, and even a few other vowels, but those seem to be the only two syllables that she’ll repeat. I finally caught her saying “muh muh muh muh” for the first time today! 2) Scooting. 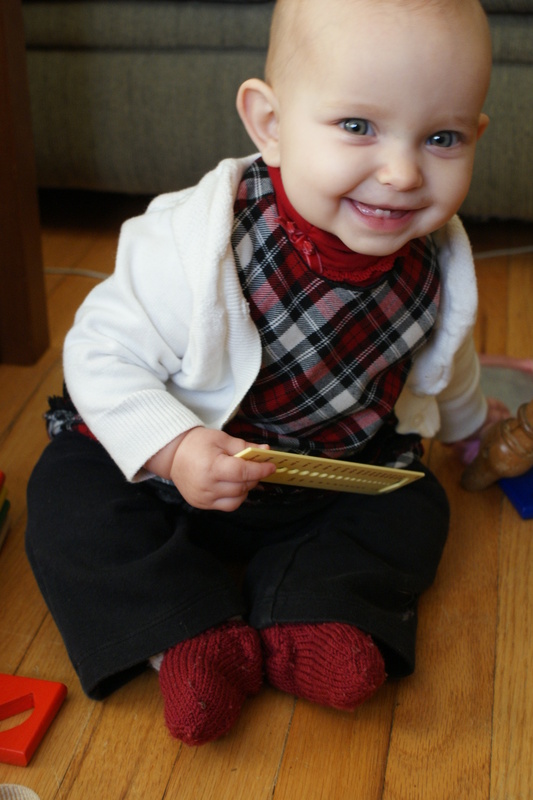 She isn’t crawling so much as… levitating. Or apparating. Or something. She manages to move herself several feet when I’m not looking, apparently by no means other than sort of willing her wiggles in a particular direction. This is effective, but slow. 3) Object permanence. This is a glorious thing. Like, I can walk out of the room for ten seconds without her being overwhelmed by emotions of abandonment. (Or she’s just already stuffing it, but I doubt it.) 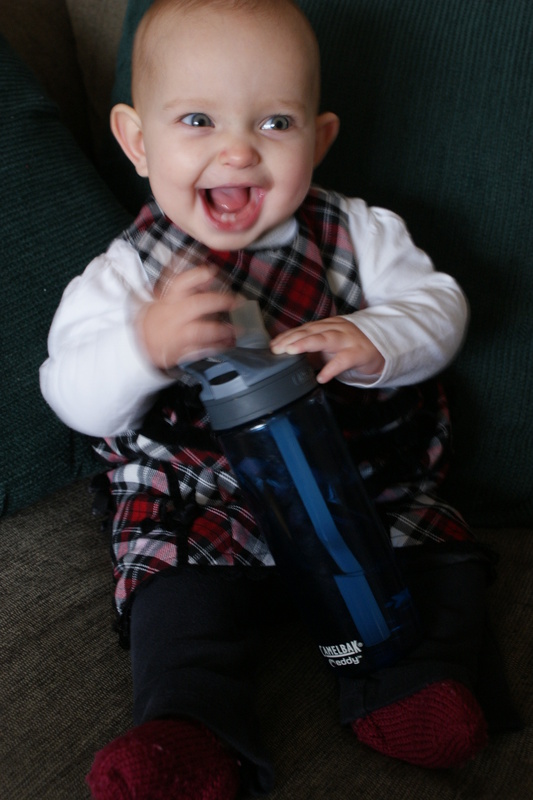 If you put 2 and 3 together, you realize what I have is a glorious window of time when she is entertaining herself happily and not (particularly) mobile. 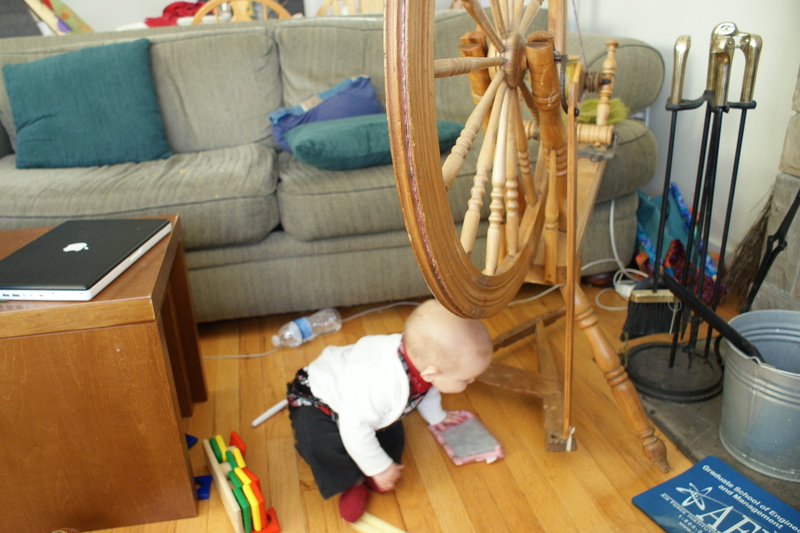 Like, yesterday I swept and mopped the whole downstairs floor while she played with blocks on the rug. It was amazing. 4) Fussing. Willpower has its downsides, though. By the end of the day we both tend to be pretty pooped (mostly non-literally) and bored of each other, and sometimes this comes out with at least one of us doing a lot of whining. My favorite is when she’s fussing because she’s hungry, and her reaction to being offered food is to melt down. Or she’s fussing because she’s wet, and her reaction to being put on the changing table is to cry like the world has ended. I consider my capacity for sympathy to be surprisingly large (and the demands on it very reasonable), but I have limits. That’s just life, though. For the most part, we have a good time, and try to count our many blessings. Like notions bags. And a Clara dress. And colorful blocks. And a TARDIS-colored camelbak. It was so fun to see you, Naomi! I enjoyed the Dr. Who special very much because Bethany enjoyed it with me and because there were some great moments.